Complete the look of your bathroom with the Trafalgar classic Luxury Rigid Riser Kit with Exposed shower valve. It has a built-in diverter so you can switch between the fixed head or hand held shower. All kits comprise of exposed pipe work including a sliding rail, shower hose and shower head. Combined with the supplied exposed dual shower valve this rigid riser shower kit will enhance the appearance of any bathroom. 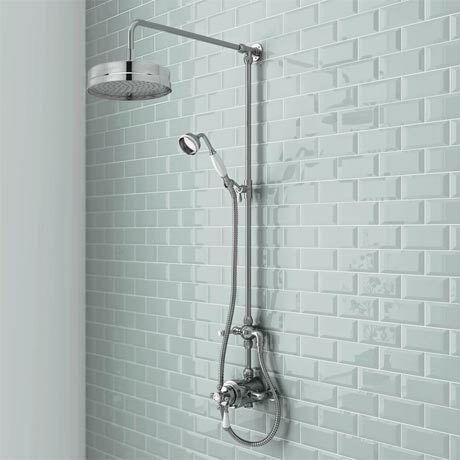 The Traditional Dual Exposed Thermostatic Shower Valve offers thermostatic showering with two easy to operate controls, one operates flow control whilst the other allows temperature selection. To be used with a fixed head or slide rail kit, this valve has the added safety benefit of a built in anti-scald device should the cold water supply fail.